A few years ago if you had offered me oats for breakfast I would have said “no thank you”. But now, any winter morning is good for oats. Dave and I were watching a program on Glen Grant Distillery which is in Scotland, and the master distiller stated that whisky is a good drink after any meal, especially if that meal is breakfast. Shortly after that, we were on the Isle of Skye staying in a B&B. The owner offered us whisky oats for breakfast, and it was this bowl of oats that changed my mind from ‘no thank you’, to ‘yes please’. It took us, and by us, I mean Dave, quite some time to perfect the recipe for perfectly creamy, properly cooked whisky oats. The whisky is a vital part of this breakfast meal but if you have children you can leave the whisky out. We use a good quality single malt distilled here in the Western Cape. Whichever whisky you choose to use for your oats, make sure it is one you would drink! This hearty breakfast will warm you up on a cold morning. 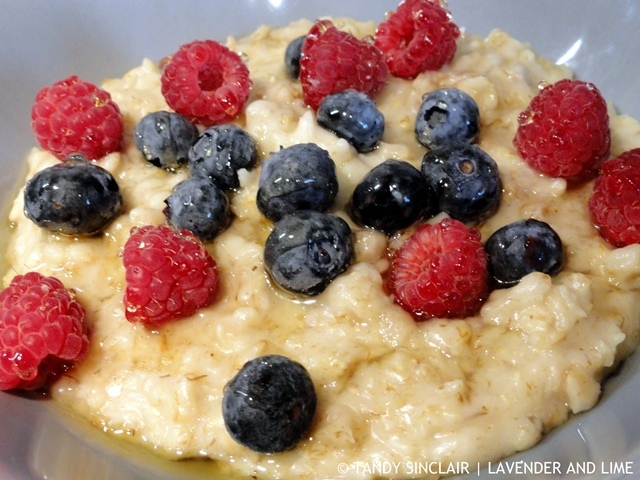 If you don't have time to leave the oats to soak, it will just take longer to cook them. Add some milk to the oats if you want when serving. Blog-checking lines: For the March Daring Cooks’ challenge, Ruth from Makey Cakey invited us to start the day with something filling, warm and nutritious. We got to experiment with different techniques and flavourings to create our own perfect personal porridge. Ooo I’m intrigued. An excuse to have whiskey with breakfast?! I can be down with this. wow this looks interesting! I’ve been eating a lot of oats lately, thanks for sharing! Just look at those oats Tandy :). I would eat this any day of the week. I love oatmeal but have never had whiskey oats. This is perfect for St. Patrick’s Day. Or any day really! I’ve never heard of whisky oats, but they look delicious! Love that you added some berries! YUM! I love porridge and remember on takign Big Man to Scotland for the first time he was given porridge for breakfast with a little nip of scotch in a beautiful cup – I think they called it a friendship cup! What a great way to celebrate Saint Patrick’s day, this might be one way to get my husband to eat oats. Thanks Tandy! It looks tasty. I bet that whisky really warms you up! I usually eat eggs every single morning for breakfast but I think these whisky oats look like a great way to change things up. I actually really like anything with oats in it, I find it very filling! Hope your week is off to a great start! Oh yum, I am sure those were great!